As the world’s most innovative companies take note of the strategic advantage brought by industrial designers to business, the Industrial Designers Society of America is declaring Design IS Business at its International Design Conference 2017. Registration is open for the premier networking event—which is set for Aug. 16–19 at the Atlanta Marriott Marquis and culminates with IDSA’s International Design Excellence Awards (IDEA)® Ceremony and Gala at the Woodruff Arts Center on Aug. 19. There’s no better way to learn about the impact of design on business than from one of the most renowned brands and corporations in the world—Disney. The keynote presentation will be delivered on Aug. 16 by Walt Disney Imagineering President Bob Weis and Shanghai Disney Resort Vice President of Operations Andrew Bolstein. They'll speak on "Making the Impossible, Possible"—sharing how highly skilled teams, representing dozens of disciplines, come together to create immersive experiences that inspire emotional connections with guests around the globe. “Businesses are reserving a seat on the board for a chief design officer, assimilating design strategy or making room for design to influence their direction significantly,” explains Conference Chair Jeevak Badve, IDSA, VP of Sundberg-Ferar. More speakers at the intersection of design and business include James Sommerville of Coca-Cola; Sean Carney of Philips; Randy Hunt, formerly of Etsy; Nate Young of Newell Brands; Julia Burke of Whirlpool; Joel Kashuba of Fifth Third Bank; Peter Machaelian of Dolby Laboratories; and Bob Wheeler of Airstream, Inc.
Other speakers will be featured in a rapid-fire format including Max Burton, IDSA, MATTER; Ti Chang, IDSA, CRAVE; Seth GaleWyrick, Bresslergroup; Liam Hawry, Studio One Eleven; Chris Kaye, IDSA, US Endoscopy; Marlisa Kopenski, Design Concepts; Tsai Lu Liu, IDSA, and Shea McManus, North Carolina State University; Evan MacDonald, Freefly Systems; Lisa Marks, IDSA, Berea College; Nahla Osman, Huge; Jennifer Peavey, IDSA, Eastman Chemical Company; Brian Roderman, FIDSA, IN2 Innovation; Florian Vollmer, InReality; and Stephen Wilcox, PhD, FIDSA, Design Science. Aug. 17—Business of Corporate Design Studios (moderated by Badve): David Dombrowski, IDSA, Pfizer Consumer Healthcare; Marc Hottenroth, IDSA, GE Appliances; Joe Jasinski, IDSA, Dell; Rajat Shail, Honeywell; and John Suh, Hyundai Ventures. Aug. 18—Business of Design Consultancy Studios (moderated by Badve): Scott Clear, RKS Design; Qin Li, IDSA, fuseproject; David Thimm, IDSA, Sundberg-Ferar; and Carrie Vincent, frog design. Aug. 19—Future of ID and Education (moderated by Kevin Shankwiler, IDSA, Georgia Tech): Michelle Berryman, FIDSA, Liquid Hub; Owen Foster, IDSA, SHiFT Design Camp and Aether Learning; Byeong Cheol Hwang, PhD, Savannah College of Art and Design; Julia Kemp, Harvard Business School; and He Renke, Hunan University School of Design. On Aug. 16, the IDSA/Eastman Education Lab Symposium 2017: Emergent Pedagogy in Design, will be chaired by Scott Shim, IDSA, of the University of Notre Dame. Speakers are set from Arizona State University, Brigham Young University, Illinois Institute of Technology, Iowa State University, North Carolina State University, The Ohio State University, Parsons School of Design, Rochester Institute of Technology, University of Houston, Virginia Tech, Doblin/Deloitte and DesignIntelligence. On Aug. 17, the IDSA Career Center 2017 kicks off with a networking lunch, followed by Sketch Aerobics™ with Jose Gamboa, IDSA, and Simulation in CAD for Designers by Jeff Smith, IDSA, of Autodesk. Then, join the ever popular Portfolio Review, as professionals take a closer look and offer advice on putting your best work forward. On Aug. 18, several IDSA Awards winners and inductees into IDSA’s Academy of Fellows will be announced and the five IDSA Student Merit Award 2017 winners will be recognized. That evening, visit some of the hottest design studios in Atlanta, as they open their doors to conference attendees. For the first time, Super Saturday Morning sessions on Aug. 19 are designed to thrill the youngest generation. Conference-goers and their children as young as age five will be amazed by magician and innovation consultant Michael Mode of Big Lightbulb, Inc.; bird expert Francie Krawcke and her feathered friends; Mark Zeller of Fisher-Price; Ryan Ringholz of PLAE children’s shoe company; Michael Laris, IDSA, of PlayPower playground maker; and Steve Burris of KIDS II. 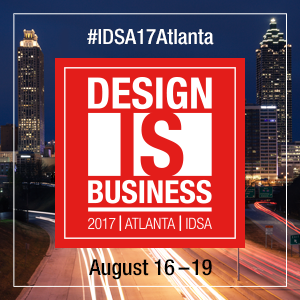 Follow the journey using #IDSA17Atlanta and #IDSAIDEA @IDSA on Twitter; Industrial Designers Society of America on Facebook and LinkedIn; and @IDSAdesign on Instagram. Sponsorship opportunities are limited; contact sponsorship@IDSA.org. To schedule press coverage, contact media@idsa.org. Sponsors are Samsung, Autodesk, Eastman Innovation Lab, General Electric, Prototype Solutions Group, Savannah College of Art and Design, Sundberg-Ferar, Dassault Systèmes SolidWorks, Model Solution, Carnegie Mellon University, Tactile, Appliance Design, Covestro, Philips and .design. Partners are Arcade, Azure, Core77, Gray, Plastics Industry Association, RGD, Society of Plastics Engineers, Wanted Design and Cooper Hewitt, Smithsonian Design Museum.